The screw juice extractor is specially designed for extracting juice from fruits, such as apple, and pear. We are engaged in offering qualified juice machines that are sturdy in construction and simple to operate. To ensure protection from rust, the side frames of the screw juice extractor are made of graded cast iron and coated with epoxy paint. 1. The juice produced by screw juice extractor is 100% fresh and natural, free of impurities. 2. High-quality stainless steel construction. 3. The screw design ensures a high extracting yield. 4. A large output from 500kg/h to 1.5t/h for your choice. 5. Sanitary and easy to clean. The fruits should be first peeled and cored if necessary and then crushed into the small granule, the smaller size, the better for juice squeezer. 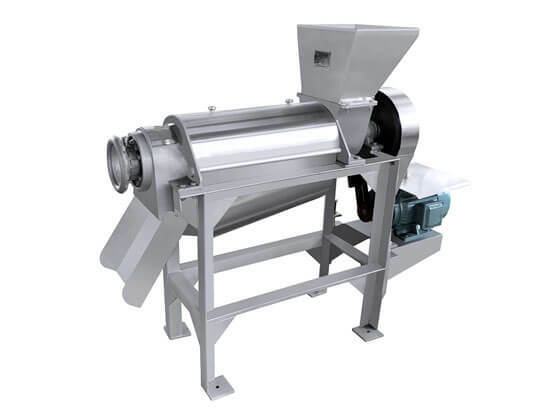 When the fruit/vegetable granule drop into charging spout, they are propelled to the spiral chamber which is of gradually narrow design. Because of the narrow space in the spiral chamber, the granules are pressed as move forward. Fruit juice is filtered by the screen before flow into the bottom container. The slags are discharged from the circular clearance between the spiral shaft and regulating head. 1. Fruits: apple, pear, banana, watermelon, strawberry, kiwi fruit, pineapple, etc. Attention: All the fruits and vegetable processed by spiral juice extractor should be peeled and cored first, small size fruit flesh is good for prolonging sprial juice extractor life. 1.Superior Nutrition–one glass of fresh juice nutrition is equivalent to several pounds of fruit and vegetables. 2.Quick Absorption - the nutrient contained in fresh juice can be absorbed within minutes. 3. Low calories– fresh vegetable and fruit juices should be included in any weight loss plan to provide abundant vitamin and mineral nourishment while little calorie intake.